This weekend, while on a peaceful hike in Shenandoah, I saw another hiker scrambling back up the path, eyes wide. He slowed down when he saw me, and explained in a breathless North Carolina accent, "Bear! There's a bear just around the bend. I'm not kidding!" Given that I didn't see a large animal streaking after him, it did cross my mind that this was a practical joke, of a how-to-freak-out-hikers variety. But fear poured off him in large waves, a fear I doubted anyone could mimic so well. On our way to Banff on the Canadian border, his bear spray was confiscated. Apparently the high-powered American version isn't legal in Canada. When the sweaty North Carolina man stood in front of me, breathing heavy and pushing his glasses back up his face and babbling about bears, one part of me thought: finally. Wouldn't my ex be thrilled and vindicated that my hiking habit had at last up and got me mauled? 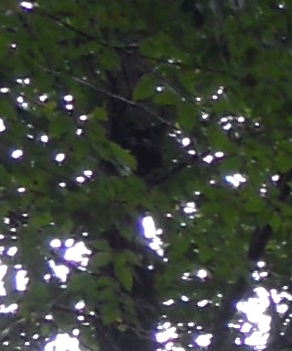 Other hikers arrived on the path behind us, and heard the tale from North Carolina: "I heard this noise, and I was thinking it was a noise too big for a squirrel, and I looked over to the tree, and the bear was there, climbing!" I noted he left out the part about hightailing it back up the path at a dead run. He gave me a sidelong glance of, hey, don't mention that unmanly moment, and certainly, I don't disagree with his fear. I'm not sure I would have run quite so quickly, but that's only because it seems like a recipe for becoming Yogi's snack food, running like prey. A real, live, unexpected bear (not just the ominous floating worry of possible bears) would set off an adrenaline cascade for me too. Emboldened by larger numbers, the crowd of us turned the bend in the path and, lo and behold: a black bear. Peacefully rooting around in the trees, pulling down a little bark here and there, she seemed not all that concerned by us. It's a big forest, after all, and we were puny looking, why would she worry? One hiker got much, much closer to take a photo, and while he moved slowly all along, he came back with that same wide-eyed look. "I thought she was going to charge me for a minute," he said. We stood there on the path, waiting for the bear to leave, wondering why the normally shy creature didn't move along. Black bears, unlike brown bears (such as grizzlies), are seldom aggressive to humans. Barely visible bear cub in tree. Finally, we looked up. Up in the trees, snoozing in comfort and out of harm's way, were two cubs. We didn't want to leave. To be in the presence of a large animal simply going about her day, this is a moment to take a breath and marvel. The only other encounter I'd had with a bear was on a camping trip with that same old bear-phobic beau. We were standing by the car, and suddenly, we were both inside the car, piecing together that there had been a loud, loud noise, and so we'd moved fast to seek shelter. I never saw the bear then, and for all I know, it was just a large, clumsy raccoon who smelled the strawberries we had in the tent (large camping faux pas there), and then thought better of it when we turned on the headlights. My friend may have developed his bear fear then, or maybe he'd had it all along, the fear of Something being out there, the big Badness in the woods. I've had my moments too, hiking alone in remote areas. Once, I worked myself up enough several miles into a long hike that I decided to sing loudly (and off-key) to warn any creatures of my arrival. This made for a blushing moment when other hikers rounded the corner -- it turned out the area was not so remote. The wonderful thing about singing, however, is that it's substantially more difficult to feel fear while singing at the same time, a little lesson I keep in my back pocket when I need to keep imaginary bears at bay. I'm not much of one for signs, usually, but I'd had an interesting morning that day of decisions, so risk and direction were on my mind long before the bear crossed my path. Sure, the bear that day could have turned and bitten me, could have chased after North Carolina or another hiker that stepped too close. She is wild and unpredictable. But that isn't what happened, and being up against a real occasion of an imagined fear was, in the end, not really scary. As with most fears, upon close examination, they melt away so as long as I view them clearly and calmly and treat them with respect. Mostly, Mama Bear didn't much care what we did, so long as we didn't mess with her or her cubs. I don't suggest foolhardy behavior -- don't try giving a bear a bear hug -- but do go for a walk in the woods. Sing if you need to.